Good morning, and it’s a soggy one. This won’t herald a total washout this weekend, but it has brought autumn back to the region after a mostly summery week. Right off the bat, radar as of about 5:15 this morning shows numerous showers and embedded thunderstorms working across the region. Expect off and on rain to continue all morning, gradually slowing down and becoming more infrequent this afternoon. We should dry out tonight. The rain is actually occurring behind a cold front that has basically pushed through everywhere as of 5:15 AM. Just about all of us are in the 50s now, and don’t expect it to get much warmer. We will probably drop another few degrees this morning before stabilizing this afternoon. By tonight, those temperatures will settle into the upper-40s to around 50 degrees. 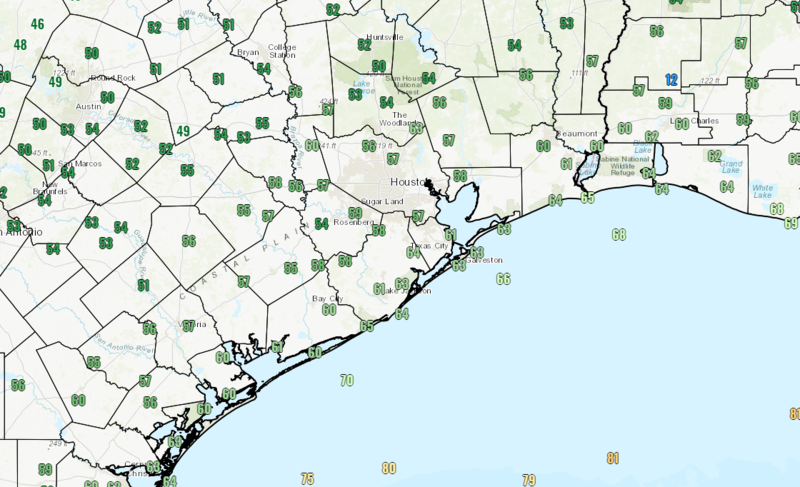 It will also be breezy at times today, with a steady north wind around 15 mph, but higher along the coast and Galveston Bay where wind advisories have been hoisted. Saturday should be a bit of a gloomy looking day, but I don’t believe it will be a day where you need to adjust many plans. Look for a mix of clouds and a little sun. In the afternoon, there could be a few showers around. With a dry atmosphere, it would be unlikely that much of the moisture survives the trip from the clouds to the ground. I think the best chance for real showers or some rain to occur would be along the coast by later Saturday afternoon. On Saturday night, expect a weak system to begin to organize offshore of Galveston. This will spread scattered showers and a chance of thunderstorms into Southeast Texas overnight and during the day Sunday. I don’t think Sunday will be a washout for everyone, but I do think most of us will see at least some rain. Near the coast, it could be heavy at times. 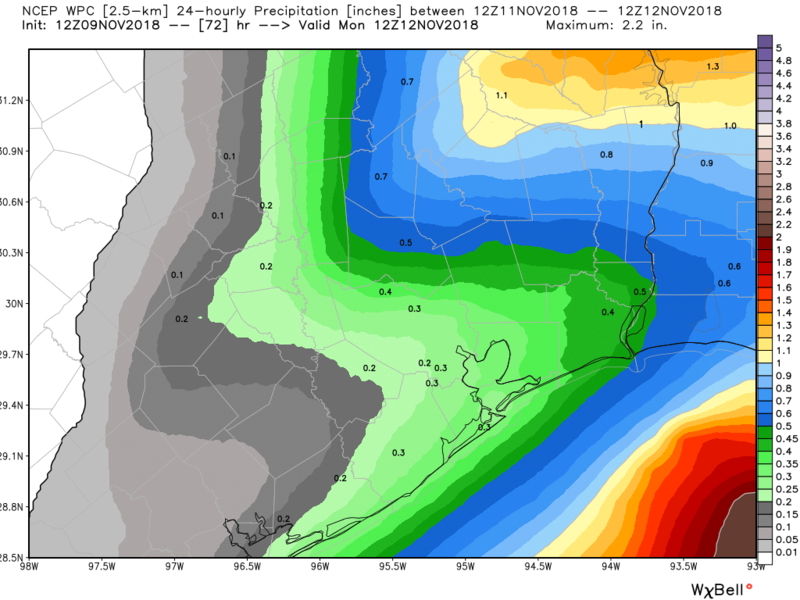 All told, we should see another quarter to half-inch or so of rainfall, with isolated higher amounts likely, especially on the coast or well north and east of Houston. Temperatures will top off in the mid-50s on Saturday afternoon. They shouldn’t drop much below the upper-40s on Saturday night, and they likely won’t get past the mid-50s in most spots Sunday afternoon as well. Sunday’s rain chances will carry into Monday, this time helped by a cold front approaching the area during the day. Monday’s weather could be a bit changeable. Expect scattered showers, light rain, or drizzle. There could be a few thunderstorms also. As of this morning, we expect the front to get to the coast by Monday evening. So we’ll probably see temperatures peak at some point in the early afternoon in the mid-to upper-50s and then begin to drop back toward the 40s by evening. Overnight lows will settle into at least the low-40s Tuesday morning. Depending on how quickly we clear out Monday night, we could see pockets of 30s on Tuesday morning north of Houston. Winds will begin to crank out of the north (yes, this is a true “norther” for Texas) on Monday afternoon behind the front. We currently expect 15-25 mph winds with higher gusts possible. At the coast and near Galveston Bay, winds should be even stronger. The good news is that dry air will surge in behind the front meaning that Tuesday should see us clear out. Expect high temperatures to limp to around 50 degrees despite increasing sunshine. Tuesday night will be our coldest of the season so far. 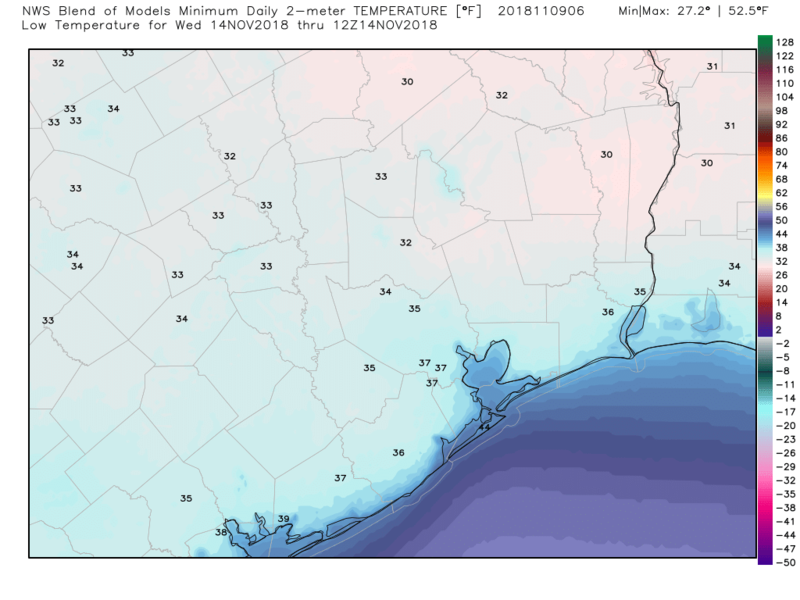 We expect mid-to upper-30s in most of the area, but low-30s are a good bet north of Houston. Model forecasts of temperatures have fallen back about a degree or so since yesterday, so the trend is gradually for colder. 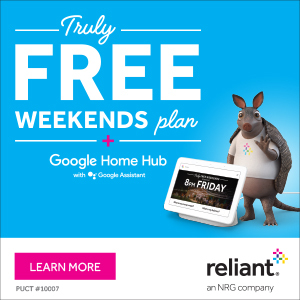 We’ll have more on this for you Monday. We’ll gradually moderate after Wednesday morning, with temperatures warming back into the middle or upper-50s and then 60s on Thursday. Right now, it looks as though we may have a somewhat extended period of drier weather in the wake of next week’s front. I feel like we’ve seen this before and it hasn’t materialized, so I’ll be a bit skeptical for the time being. But our weather modeling does seem to strongly argue for dry weather through at least the end of next week or next weekend, so we’ll see. More on Monday! Any early indication for thanksgiving weather? Too early to say anything, but my hunch is temperatures won’t be as cold as next week or as warm as this past week. Something in between seems most likely right now. Looking forward to next week. After Monday, it looks absolutely awesome! If you guys deliver, I’ll see if I can get you guys a raise. My kind of weather! is there the slightest chance if it got cold enough in some areas and there is still lingering precipitation that some sleet may mix in with the rain? I don’t think we’re quite going to get cold enough, fast enough for that to happen. The air mass dries out pretty quickly on Monday night/Tuesday. So I don’t think we’ll get there this time. I don’t think Sat night will be too awful in Huntsville. But look for rain chances to progressively increase on Sunday. Your campsite might look like Elbonia by Monday morning….